On the fourth Thursday of November, Americans celebrate Thanksgiving Day and one of the traditions is that the US president addresses members of the military services that are deployed abroad. 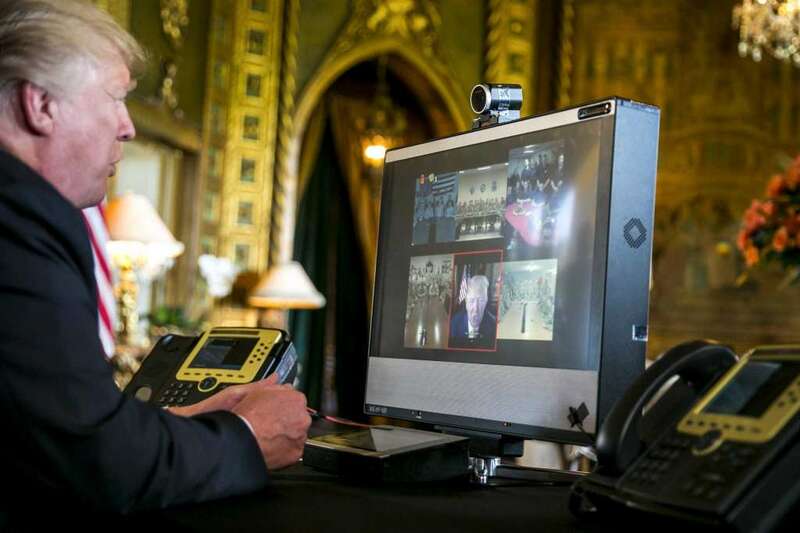 President Trump did so for the first time last Thursday, speaking to the five branches of the US military by video teleconference from his residence Mar-a-Lago in Florida. The press photos released for this occasion offer a clear view of the communications equipment that is used by the president when being outside the White House or travelling. The big screen for video teleconferencing (VTC) is the Cisco TelePresence System EX90 with high-definition video screen and camera. The device has been modified for TEMPEST protection by CIS Secure Computing: we can see that the screen has an additional metal encasing with silver labels to prevent and detect tampering. The VTC system includes a smaller touchscreen device which is used to control the video teleconference calls and can be seen right in front of the big screen. On both sides of the video teleconference screen, there are telephone sets which can be recognized as common Cisco 7975 unified IP phones, which are also modified by the communications security company CIS Secure Computing. Most visible is that instead of the standerd silver bezel or faceplate, these phones have a bright yellow one, which is the color code for the highest classification level: Top Secret/SCI. This color shows that these phones are part of the highly secure Executive Voice over Secure IP-network, which connects the US president with all major decision makers, like the secretaries of State, Defense and Homeland Security as well as the Director of National Intelligence. The phones themselves have no encryption capability - they are connected to a central network encryptor, probably from General Dynamics' TACLANE familiy. Also clearly visible is that these Cisco IP phones have a custom molded plastic housing, which provides TEMPEST protection against the leaking of electromagnetic emanations, but also includes two 1 Gigabit SC Fiber ports so the phone can be used in a fiber-optic network. These phones also meet Telephone Security Group (TSG) standards to make sure that they cannot by any means be caused to produce or transmit audio when the handset is on-hook. 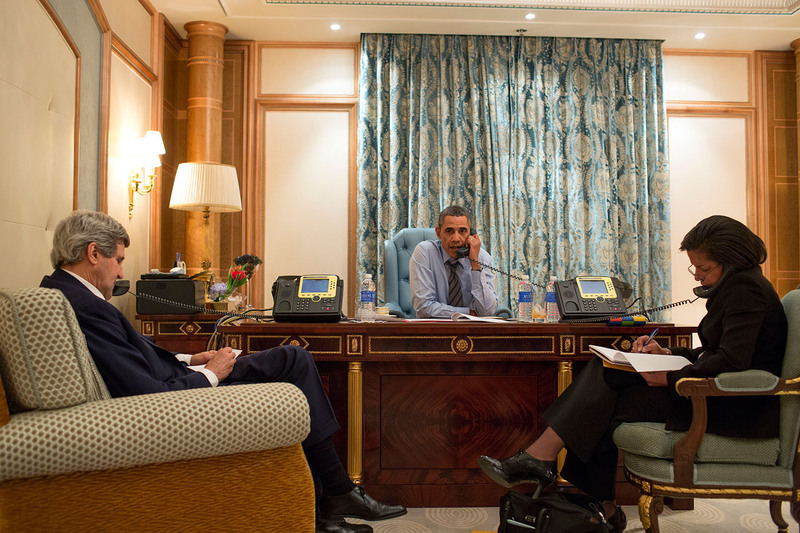 The same modified Cisco telephone sets can be seen in the photo below, which is from a room in the Lotte New York Palace Hotel, where Trump was staying last September for the UN General Assembly and meetings with leaders from Africa and the Middle East. Additionally, there's a newer Cisco 8841 IP phone, which is modified by Advanced Programs, Inc. (API) to provide on-hook security for the handset and the speakerphone. This phone is for any non-secure calls and is also used in the White House. 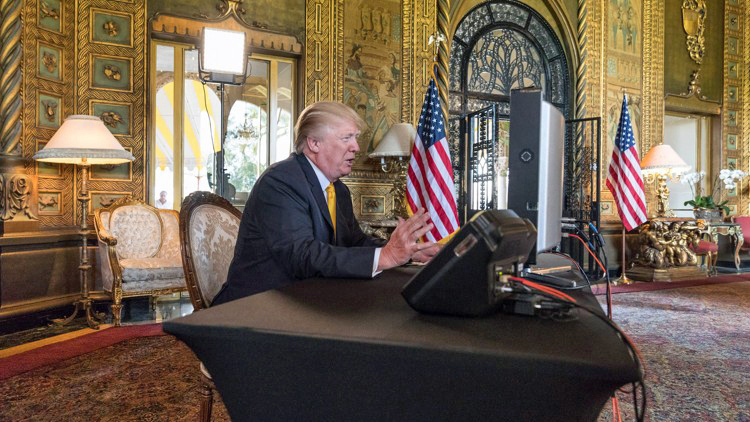 For the Thanksgiving photo op, the communications equipment was set up in the large living room of the Mar-a-Lago estate, most likely to provide a grand, if not to say regal decor for the press photos, but it may also indicate the absence of a dedicated secure communications room. At least it seems to show that the White House Communications Agency (WHCA) considers Trump's vacation residence less secure than Obama's. 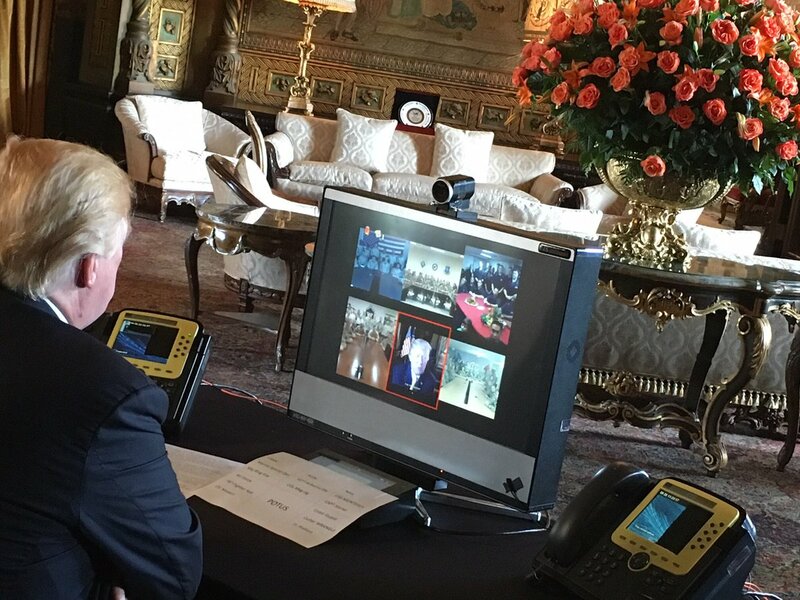 Ever since Trump started using Mar-a-Lago regularly as his "Winter White House", there was speculation whether a Sensitive Compartmented Information Facility (SCIF) was created, which means a room that is protected in such a way that classified Sensitive Compartmented Information (SCI) can be stored, processed, viewed and/or discussed without being intercepted from the outside. 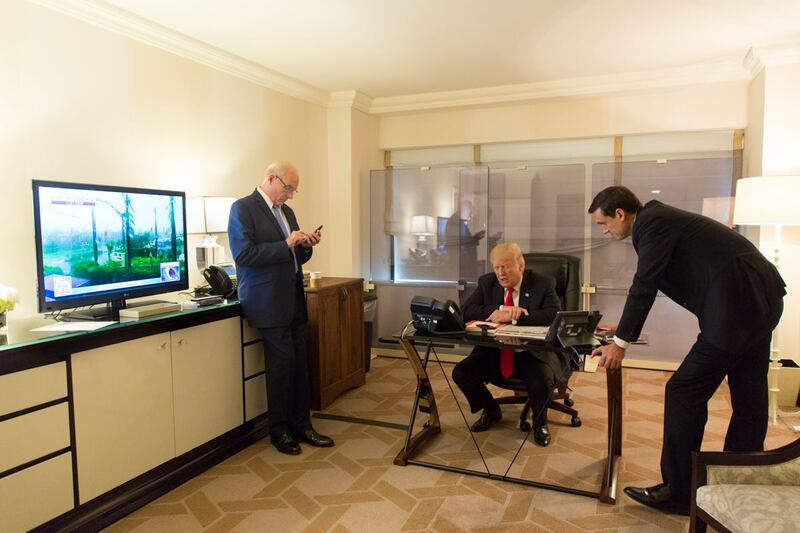 In April of this year, the White House press secretary tweeted a photo showing president Trump meeting with his national security staff in a provisionary situation room at Mar-a-Lago, which was apparently intended to look like a SCIF but may actually just have been a temporary set-up. 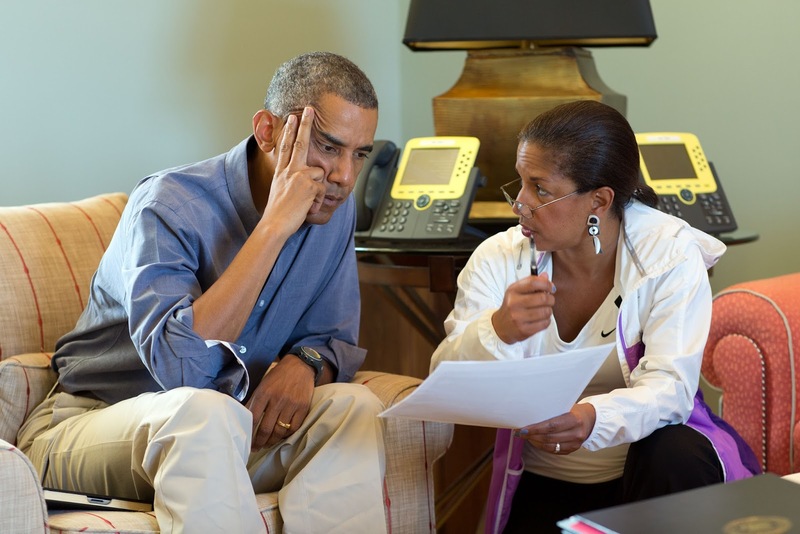 The mysterious devices seen in that photo were discussed here earlier.